Mix all the ingredients for the marinade to make a thick paste. 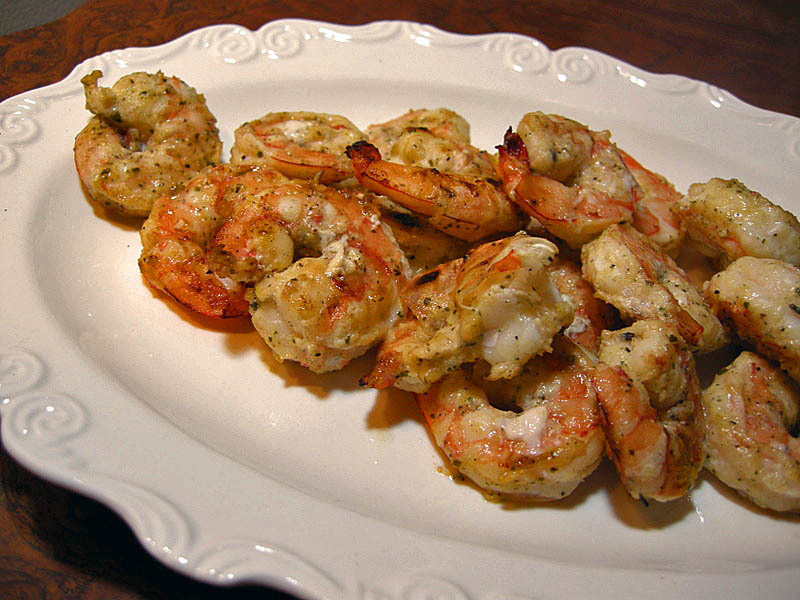 Thread the shrimp onto wooden or metal skewers, place in a tray with the marinade spread all over to coat them well. Let it stand for 10 minutes while you heat the grill. Remove the shrimp from the marinade, add to the hot grill, cook for 5 minutes total, flipping them around midway through. Mix sour cream with Sriracha sauce (or other hot sauce of your preference); make it as hot as you like, and drizzle over the shrimp or use it as a dipping sauce. Comments: Even though we’ve been in Los Angeles for almost 4 months, I still try to find stuff in a drawer, only to realize the item in question is 1,200 miles away. That is precisely what happened while attempting to make this recipe – my nice set of metal skewers did not make it to LA. Plan B was quickly put to work: I spread the shrimp all over the grill, working as quickly as possible. Voila‘: success! The frozen cilantro thing… The first time I bought Dorot frozen cubes, I only did it because the tray of ginger looked impossibly cute, AND the store did not have fresh ginger for sale. I used it, and loved it. Later I tried the basil. Loved it too. Now, cilantro joined the party. I don’t like to cut too many corners in cooking, but these products are excellent. Misture todos os ingredientes para a marinada formando uma pasta grossa. Enfie os camaroes em espetos de madeira ou de metal, coloque em uma bandeja com a marinada cobrindo por completo cada camarao. Deixe descansar por 10 minutos enquanto aquece a churrasqueira. Retire os camarões da marinada, coloque na grelha da churrasqueira e cozinhe por 5 minutos ao todo, invertendo os espetinhos no meio do tempo de cozimento. Misture o yogurte com o molho de pimenta, de acordo com seu gosto e regue os camaroes ao servir. I’m a miso nut! I haven’t tried it on shrimp but this sounds great. I use miso in a lot of salad dressings – my current favorite is a vegan caesar dressing that has miso and capers. I love hearing about more ways to use miso. I always buy a tub and then can’t figure out what to do with it after one use. And, sour cream and sriracha? I can’t wait to try that too! Hope you’re having a great holiday season! So tasty, and so easy – this goes into my regular set of recipes for busy days for sure! Thank you, Sally!